Interiors Magazine? One word: Wow. I had the pleasure of attending a panel hosted by Interiors Magazine editorial director Michael Wollaeger while at BLOGFEST 2012 . Guests included designer extraordinaire Miles Redd, architectural photography pioneer Peter Aaron and style editor/blogger Marisa Marcantonio. Back in my Boston area office, I opened the June/July issue. My jaw dropped. I turned a few more pages. No, this was not a dream! One word: Wow. Reading through this magazine is like reading a beautiful Art book. One needs to savor images slowly, taking regular breaks in the process. The interiors are absolutely breathtaking, and the photographs are pure and transparent, showcasing the rooms perfectly, as if one were standing very still, taking in the space. French Interior Designer Pierre Yovanovitch, who used to be a Fashion Design for Pierre Cardin, created this lovely built in sitting area for a Parisian couple in their 17th arrondissement flat. Designer Kevin Dumais created a textural, soothing and minimal look for this modern Nashville home. Dumais draws inspiration from the Seventies. I love how the oak library shelves and paneling contrast with the metal fireplace, the mohair sofa and clear coffee table. Sitting area in the same house by Dumais. I love the blues and pale camels and the interplay between the architectural perspectives in the wall art and the geometric rug. Capri kitchen by Architect Guilano Andrea Dell’Uva. White lime was applied to the ancient stone walls, creating depth and texture. I love the gigantic cut out of the black windows against the zippy white and yellow. A brilliant composition. Windsor Smith Interior. A master of balance, color, shape and texture. My apologizes for taking mediocre photos of the Interiors Magazine photos: I hope this article entices you to check out their wonderful magazine, which exists in a paper and an online version! After the ICFF, Blogfest 2012 attendees were whisked off in buses to Kips Bay for the grand Kickoff of the tour, hosted by the lovely Margaret Russell, Editor in Chief of Architectural Digest. What is a Show House, you ask? Simply put, a designer show house is a space in which different rooms are decorated by a few select and talented Interior Designers or Decorators, who are usually given a very short time frame to do their magic. The amount of hair pulling to meet deadlines must be tremendous, but the interiors created are superb and offer a wonderful venue for designers to showcase their talent. Show Houses benefit a charity: they are typically associated with a fundraising event, and can be visited for a fee. Kips Bay is famous for its extraordinary show of designer rooms and benefits the Kips Boys & Girls Club located in the Bronx. The Show House celebrated its 40th anniversary this year. If you can imagine more than 160 bloggers/interior designers squeezing themselves through the penthouse rooms, you will understand why I have a limited amount of quality wide angle photos to show I concentrated on selecting mini vignettes to share with my readers. The massive and sculptural ceiling lighting in the Aldyn lobby was not to miss. “In Memoriam of Albert Hadley” By Bunny Williams, David Kleinberg, and Brian McCarthy. I love this wood mirror above the console table. Of course the branches contribute to giving this vignette grandeur and an organic feel. “The Cabana” by Scott Sanders. Scott was in the room himself and kindly answered my questions. His room was bubbling with good humor. I loved the yellow grasscloth covering the walls, against this white lacquered desk by Lorin Marsh. Another vignette in Scott Sanders’ Room. Gorgeous alabaster lamp by Lorin Marsh. “The Conservatory” by Neal Beckstedt Studio. Le Corbusier Chaise. Lovely, stylish vignette by Neal Beckstedt. Italian 1950s Bar Cart. Neal Beckstedt. Neal and I exchanged a few words on the importance of texture, and I feel he does a superb job of layering and telling a story. Chevron Gear Table Lamp by Robert Altman. Blue sculptural bowl by Martin Kline. “Foyer” by Timothy Miller of Timothy and Associates. Timothy was very excited to be invited to decorate the Kips Bay for the first time! His use of two Daum Tulip vases-including an ultraviolet one- with discreet back lighting was spectacular on the Rosewood Saarinen table. I had never seen one with a rosewood pedestal but Timothy informed me it was a unique piece. “Kidz Rule” by Laura Bohn Design Associates. This bedroom was just fantastic, a little green and red fuzzy and textured cave for little ones. Cabrio In Space saving unit with desk/integrated bed, Edward Fields round spiral shag rug, M2L, Inc Tatino and Tatone red ottoman and seat. “The Writing Room” by Chuck Fischer Studio. Chuck was happy to take questions and explained he created and hand painted the Chinoiserie Mural, as well as the Lee Jofa desk chair. I liked the pale and soothing melons and roses in this room, mixed with browns and blues. Another view of a spectacular retro two arm floor lamp Chuck found at Alan Moss Antiques. “Gentleman’s Study” by David Scott Interiors. David (shown seated here) had created a very layered, masculine and glamorous study which I really enjoyed. Here he is pictured in front of the most striking Larry Zox painting, a lesser known but rising artist who found success during the Color Field Movement of the 60’s. The painting did a lot to the room, creating a wow effect. Sculpted Bronze étagère by Paul Evans in this David Scott study, George III writing table, Jacques Adnet floor lamp. Custom Omnibus Chaise Lounge by Vladimir Kagan Couture across from the desk. “Le Bureau Privé (The Private Office)” by the very talented Raji Radhakrishnan (Raji RM & Associates). Sebastian Ezzaruiz Tilt Bookcase and Ralph Lauren Collector Desk. Another view of Raji’s Room with Christophe Côme Loukoum Lamps. After champagne and this extraordinary tour, we were off to Savant to learn about automation systems for residential and commercial applications. Floating TV screen projected behind this bathroom mirror. Note, reflected in mirror is the wall control panel, allowing for control of lights and TV in the room. All Savant interiors in the NY showroom are decorated by Thom Filicia. Great shower tiling detail in the same bathroom. After this, some of us continued on to the next venue, Savoir Beds, to try out luxury mattresses and nibble on lemon and chocolate cakes. Savoir is a line Savoy Hotel created back in 1905 to keep their guests comfortably tucked in! It was a fabulous day filled with intensive learning and discovery. Thank you, Kravet and thank you, Blogfest 2012! While at Blogfest, we were encouraged by House Beautiful editors to write about what inspires us, what might have been the moment in our life that prompted us to choose this profession, or what “AHA moments” we encounter in our daily work. I have to say Aha Moments abound in my life. Like the time I realized very early on I was happiest creating and working with COLOR. Illustration in my “cahier” at the French School. I fancied myself a talented designer in the making: my goal was to be a fashion designer. From age 10 on, I had developed a mad crush on FABRIC and spent my time making little outfits for my barbies, or inventing little bags and decorative boxes out of Marimekko fabrics. Sweater line created by Barbara Elza Hirsch back in the 80’s. Little summer bags created by Barbara Elza Hirsch while a student at Studio Bercot. Alas, my career as fashion designer was never to be. I HATED the fashion world! If you’ve ever seen The devil Wears Prada, you know what I am referring to. Little did I know that somewhere deep inside, was an interior designer in the making. Years later, as a wife and mother still enamored by COLOR and passionate about DESIGN, I found my true calling : Interior Design! Windsor Smith fabric for Kravet on wing chair with contrasting piping. Custom creation by Elza B. Design, Inc.
A color scheme on a current Elza B. Design project. Inspired by a beautiful painting my client owns. “Life is a Big Room” by Barbara Hirsch, done as a child. Aha! I should have known There was a room in me after all. I dragged my luggage through long corridors, up into the subway, down escalators and carried bulging bags filled with awesome magazines, incredible gifts from BlogFest2012, battled rain and ended walking barefoot in Brooklyn on a particularly pouring evening; I met design celebrity after design celebrity, spoke with amazing people, stuffed my pockets with business cards and toasted many champagne glasses; I met an amazing family owned business (the one and only Kravet), snapped picture after picture, took notes and went to bed at ridiculously late hours, learning about design day in and day out. I came home exhausted but over the moon. Where in the world did I go???? 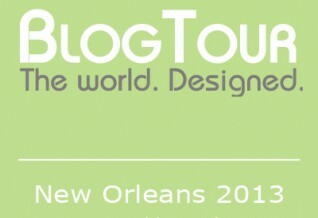 The Kravet Group launched the Blogfest 2012 concept in 2011. It has since become an amazingly popular destination for interior designers and bloggers who blog about design. This year, registration for the event sold out in 4 hours! Blofest 2012 defines itself in these words : Blogfest is a three day tour designed exclusively for interior design bloggers featuring the industry’s top shelter magazines, A-list design celebrities and breathtaking venues. Follow me as I take you along and share highlights of my trip. Before meeting our Blogfest hosts and friends, we were offered an optional ticket to the ICFF. I took advantage of this time to take a few photos of interesting items. Stone Source- screen printed Porcelain tiles in incredible colors and patterns. Spalted Beech Wood Chair by Asher Israelow. Incredibly comfortable and beautiful design. Desk in background is by same designer. This chair also by Israelow was very comfortable as well and the leather offered a soft contrast next to the wood grain. Wewood French oak piece with beautifully crafted drawers would make a nice statement in a room or in an entry foyer. You could put all your keys, mail and small items in it! Textile Print Designer Julie Kouamo is based in London where she creates wall coverings and fabrics. She likes to create textural patterns mixing old and new dyeing and printing techniques. Another creation by Julie Kouamo, in which she draws inspiration from printing techniques used in her native Cameroon and mixes them in with photographic elements drawn from nature. Juju Papers Handmade wallpapers from Portland, Oregon were whimsical and could look fabulous inside a child’s bedroom for example. Another design by Avery Thatcher of Juju Papers. Double R Studio eco-friendly wallpapers. Artist Rosa Ruey is inspired by organic shapes and Chinese landscaping painting. Handblown glass Silver lining Chandelier by Tracy Glover. Barcelona foozball indoor and outdoor tables. Now, how cool was that? Another lovely Massant outdoor chair. Soft, curvy, sturdy and comfortable chairs by Cecilie Manz for Fritz Hansen. I love that they are so carefully crafted with soft felt like fabrics, available in dark or light grey for the exterior and warm to cool colors for the inner. A thin band of leather piping follows the edges. What a way to start my Blogfest adventure! Thank you, Kravet and Blogfest, for this opportunity to visit the ICFF before the Blogfest kick-off! Until next post…part 2 of Blogfest 2012 with fabulous more designs!